In Single Pole MCCB, switching & protection is affected in only one phase. Application: Single Phase Supply to break the Phase only. In Two Pole MCCB, switching & protection is affected in phases and the neutral. Application: Single Phase Supply to break the Phase and Neutral. In Three Pole MCB, switching & protection is affected in only three phases and the neutral is not part of the MCB. 3pole MCCB signifies for the connection of three wires for three phase system (R-Y-B Phase). Application: Three Phase Supply only (Without Neutral). In TPN MCB, Neutral is part of the MCB as a separate pole but without any protective given in the neutral pole (i.e.) neutral is only switched but has no protective element incorporated. TPN for Y (or star) the connection between ground and neutral is in many countries not allowed. Therefore the N is also switches. 4pole MCCB for 4 wires connections, the one additional 4th pole for neutral wire connection so that between neutral and any of the other three will supply. In 4-Pole MCCBs the neutral pole is also having protective release as in the phase poles. TPN means a 4 Pole device with 4th Pole as Neutral. In TPN opening & closing will open & close the Neutral. For TPN, protection applies to the current flows through only 3 poles (Three Phase) only; there is no protection for the current flow through the neutral pole. Neutral is just an isolating pole. TP MCB is used in 3phase 4wire system. It is denoted as TP+N which will mean a three pole device with external neutral link which can be isolated if required. For the 4 pole breakers, protection applies to current flow through all poles. However when breaker trips or manually opened, all poles are disconnected. Same type of difference also applies for SPN and DP. For any Distribution board, the protection system (MCB) must be used in the incomer. For a three phase distribution panel either TP or TPN or 4P can be used as the incoming protection. TP MCB: It is most commonly used type in all ordinary three phase supply. TPN MCB: It is generally used where there are dual sources of incomer to the panel (utility source and emergency generator source). 4P MCB: It is used where is the possibility of high neutral current (due to unbalance loads and /or 3rd and multiple of 3rd harmonics current etc) and Neutral / Earth Protection is provided on Neutral. Where to use 4 Pole or TPN MCB instead of 3 Pole (TP) MCB. When we have a transformer or a stand-by generator feeding to a bus, it is mandatory that at least either of the Incomers or the bus coupler must be TPN or 4-Pole Breaker please refers IS 3043. In multi incomer power feeding systems, we cannot mix up the neutrals of incoming powers to other Power Source so we can use TPN or 4P breakers or MCB instead of TP MCB to isolate the Neutral of other power sources from the Neutral of incomer power in use. We can use 4 Pole ACB instead of TP for safety reasons .If there is power failure and DG sets are in running condition to feed the loads, if there is some unbalance in loads(which is practically unavoidable in L.V. distribution system ), depending of quantum of unbalance, there will be flow of current through Neutral. During this time, if Power Supply Utility Technicians are working, and if they touch the neutral conductors(which is earthed at their point ) they will likely to get electric shock depending on the potential rise in common neutral due flow of current through Neutral conductor as stated above. Even fatal accident may occur due the above reason. As such, it is a mandatory practice to isolate the two Neutrals. We can use 4-pole breakers or TPN Breakers when the system has two alternative sources and, in the event of power failure from the mains, change-over to the standby generator is done. In such a case, it is a good practice to isolate the neutral also. 4 pole circuit breakers have advantages in the case when one of the poles of the device will get damage, and it also provides isolation from neutral voltage. Normally, Neutral is not allowed to break in any conditions, (except special applications) for human & equipment safety. So for single incomer power fed systems, 3P breaker is used, where only phases are isolated during breaking operations. Where We have dual Power like in DG & other electricity supply sources ,it is required to isolate neutral, where neutral needs to be isolated in internal network TPN MCB or 4P MCB can be used. The use of four poles or three poles CB will depend on system protection and system configuration. Normally in 3phase with neutral we just use 3pole CB and Neutral is connected on common Neutral Link but if application of 3pole will affect the operation of protective relay then we must use 4pole CB. System evaluation has to be required to decide whether three-pole circuit breakers plus neutral link can be used or four-pole breakers are required. 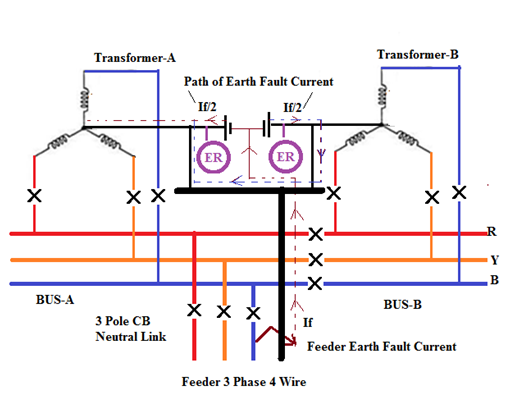 If unrestricted ground fault protection is fitted to the transformer neutral, then the bus section circuit breaker should have 4-poles and preferably incomer circuit breakers should also have 4-poles because un cleared ground fault located at the load side of a feeder have two return paths. As shown in fig a ground fault on a feeder at the bus section “A” will have a current return path in both the incomers, thus tripping both Bus. The sensitivity of the unrestricted ground fault relay is reduced due to the split current paths. In an unbalanced 3phase system or a system with non-linear loads, the neutral gives the safety to the unbalanced loads in the system and therefore It must not be neglected. In perfectly balanced conditions the neutral functions as a safety conductor in the unforeseen short-circuit and fault conditions. Therefore by using 4-pole MCB will enhance the system stability. 4 Poles will be decided after knowing the Earthing Systems (TT, TN-S, TN-C, IT). The Neutral should be switched on & off with phases. Required MCB: TPN or 4P MCB. Required MCB: TP MCB because even when neutral is cut off system remains connected with Ground. Required MCB: TPN or 4P only, because we cannot afford to cut neutral doing so will result in system loosing contact with Ground. Required MCB: TP MCB Because Neutral and Ground cable are separate. Required MCB: TP MCB because ground is provided locally. Conclusion: Its compulsory to use TPN in TN-C system rest everywhere you can use MCB. Distribution Box can be decided by “way” means how many how many single phase (single pole) distribution. Circuit and Neutral are used. 4way (Row) SPN = 4 X 1SP= 4Nos (Module) of single pole MCB as outgoing feeders. 6way (Row) SPN = 6 X 1SP= 6Nos (Module) of single pole MCB as outgoing feeders. 8way (Row) SPN = 8 X 1SP= 8Nos (Module) of single pole MCB as outgoing feeders. 10way (Row) SPN = 10 X 1SP= 10Nos (Module) of single pole MCB as outgoing feeders. 12way (Row) SPN = 12 X 1SP= 12Nos (Module) of single pole MCB as outgoing feeders. Normally single phase distribution is mainly used for small single phase loads at house wiring or industrial lighting wiring. 4way (Row) TPN = 4 X TP= 4nos of 3pole MCB as outgoing feeders =12 No of single pole MCB. 6way (Row) TPN = 6 X TP= 6nos of 3pole MCB as outgoing feeders =18 No of single pole MCB. 8way (Row) TPN = 8 X TP= 8nos of 3pole MCB as outgoing feeders =24 No of single pole MCB. 10way (Row) TPN = 10 X TP= 10nos of 3pole MCB as outgoing feeders =30 No of single pole MCB.